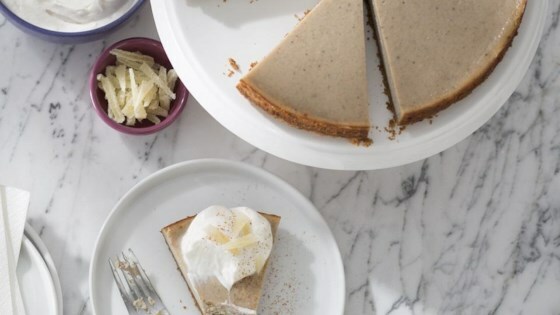 "Cashews, non-dairy milk, and silken tofu are the secret ingredients in this rich, vegan cheesecake--homey spices like ginger and cinnamon add fall flavor." Preheat oven to 350 degrees F. Lightly spray a 9-inch springform pan with cooking spray. Stir together graham crackers and brown sugar in a small bowl, then drizzle with oil and stir. Add just enough milk to make crumbs stick together. Press very firmly into bottom of pan. Bake 10 minutes. Keep oven at 350 degrees F.
Meanwhile, blend cheesecake-batter ingredients in a blender until completely smooth and no bits of cashew remain, giving blender a rest every minute or so and scraping down sides with a rubber spatula. Batter should be completely smooth and not grainy: This takes about 1 minute with a high-powered blender (such as Vitamix) or about 5 minutes with a standard blender. Spray inside springform pan (above baked crust) with cooking spray. Pour in batter and jiggle to spread evenly over crust. Bake until top is lightly puffed and edges are golden, 45 to 50 minutes. Cool to room temperature on a rack, about 1 hour. Chill, covered, at least 3 hours or, even better, overnight. Slice cake with a thin, sharp knife dipped in water. Dollop each slice with whipped topping, dust with cinnamon, and sprinkle with candied ginger. The graham crackers in your cupboard may not be vegan. Nabisco Grahams Original and Keebler Cinnamon Grahams both are. Honey and dairy products, like milk, whey, or butter, are usually the culprits in nonvegan grahams, so check the ingredient list. If you want a taller cheesecake--this one will be about 1 inch thick, more like a tart--use a smaller springform. The cake can be made up to 3 days ahead and chilled, covered. To prevent moisture droplets from collecting on the surface of the cheesecake while it chills, drape a paper towel over the pan and set a large plate on top. This is SO delicious no one will even know it's vegan.